The Burnt Part Boys is a musical epic in miniature: mountain, river, bridge and mine are conjured with the help of mime, coils of rope and a few judiciously placed chairs. Grief, friendship-under-pressure, family values and growing up are among the themes and the whole thing takes place in a space not much bigger than a living room with the audience on four sides and a hard-working five-piece band in a corner. The slightly awkward title refers to a part of a mountain in West Virginia where 10 years before – it is now 1962 – a mining disaster robbed the town of many of its fathers. The owners plan to go back on their word and reopen the section where the bodies of the men are still interred. Pete, who was four when his father died in the accident, sets off to prevent this by blowing up the mountain accompanied by his friend Dusty and with his older brother Jake – who has no choice but to work for the company – in hot pursuit. Director Matthew Iliffe manages to make all this work, aided by a cast who sing the bluegrass-style songs with tuneful conviction. Grace Osborn as a feral but lovable schoolgirl is the only female in this male-bonding world. 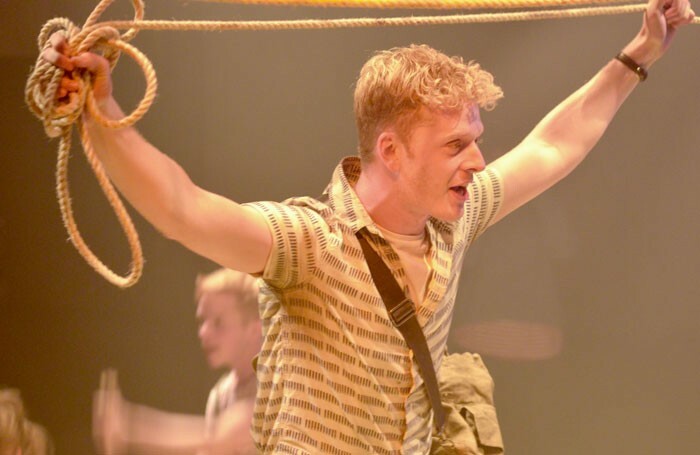 Joseph Peacock – still pre-drama school – is outstandingly good as young Pete, earnest but emotionally committed in his singing, and David Haydn as his fantasy father-figure has a stunning voice and authoritative presence. The tear-jerking ending is a touch sentimental but this unusual musical (here receiving its European premiere) is gripping and its staging imaginative.